Like many new things I suspect we all went a bit overboard in our collective enthusiasm but hey, it’s not a “cold-shoulder” blouse right? It’s probably got some longevity and will find a foothold in our culinary repertoire. So Blondies. 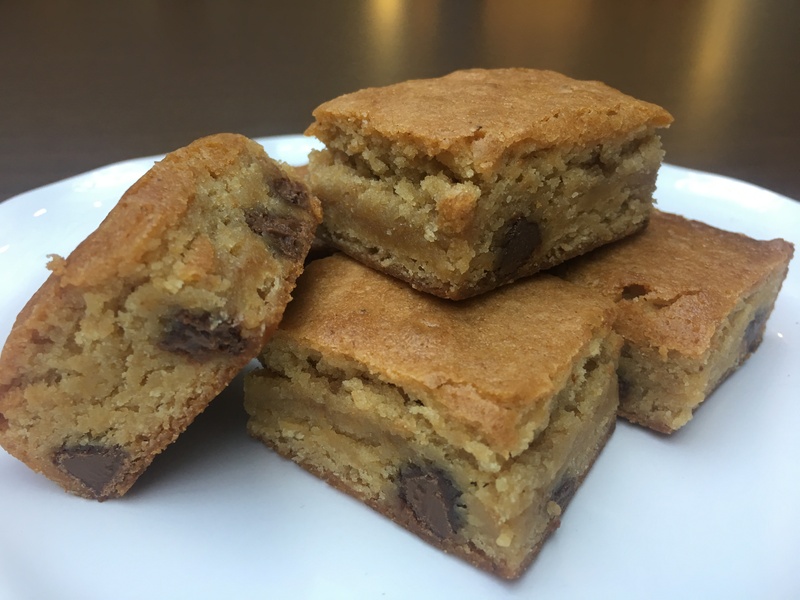 The happy intersection of brownies and chocolate chip cookies. Of course they’re great. Cook’s brings a couple of twists in addition to the brown butter: corn syrup replaces the white sugar and there’s a formidable two tablespoons of vanilla to boost flavor. Oh, and milk chocolate chips vs. the usual semi-sweet (but you’re good using whatever you have on hand). I left out the pecans due to a workplace nut allergy and threw in a few more chips to compensate. I was super annoyed to find that although I could have sworn I had a box of Maldon in my cupboard it was nowhere to be found when it came time for the optional (not optional) sprinkling on the blondies, so that element was sadly missing. I do love my salty+sweet combo so a missed opportunity and an excuse to make these again. Adjust oven rack to middle position and heat oven to 350 degrees. Make foil sling for 13 by 9-inch baking pan by folding 2 long sheets of aluminum foil; first sheet should be 13 inches wide and second sheet should be 9 inches wide. Lay sheets of foil in pan perpendicular to each other, with extra foil hanging over edges of pan. Push foil into corners and up sides of pan, smoothing foil flush to pan. Lightly spray foil with vegetable oil spray. Whisk flour, table salt, and baking powder together in medium bowl. Heat butter in 10-inch skillet (best not to use nonstick as the dark color makes it hard to see how brown your butter is getting) over medium-high heat until melted, about 2 minutes. Continue to cook, swirling skillet and stirring constantly with rubber spatula, until butter is dark golden brown and has nutty aroma, 1 to 3 minutes longer. Remove skillet from heat and transfer browned butter to large heatproof bowl. Add sugar to hot butter and whisk until combined. Add eggs, corn syrup, and vanilla and whisk until smooth. Using rubber spatula, stir in flour mixture until fully incorporated. Stir in pecans and chocolate chips. Transfer batter to prepared pan; using spatula, spread batter into corners of pan and smooth surface. Sprinkle with sea salt, if using. 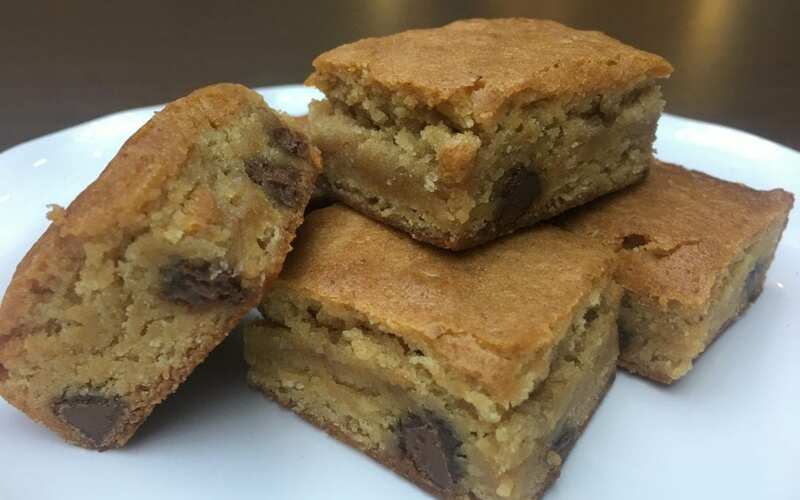 Bake until top is deep golden brown and springs backs when lightly pressed, 35 to 40 minutes, rotating pan halfway through baking (blondies will firm as they cool). Why are milk chocolate chips becoming a thing? Are they sweeter?